2013 is shaping up pretty well with Cloud Rat now confirming their new LP Moksha will be released in February, through Halo of Flies who are now streaming a new song, ‘Aroma’, on their website. 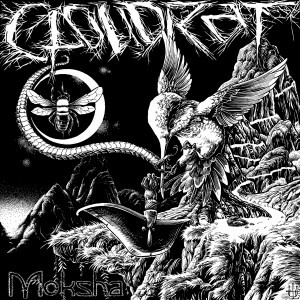 Cloud Rat’s self-titled LP in 2011 and their split with Republic of Dreams were punishing slabs grindcore inflected with astute amounts of melody and shades of screamo. ‘Aroma’ continues on that path but first opens with a juddering slow passage and Madison’s now so recognisable vocals before erupting into a terse barrage of furious grind. There are very few bands doing what Cloud Rat are doing and doing it so well. Listen HERE and check out the LP artwork below.